The following is the Boxing Insider Notebook for the week of September 18th to September 25th, covering the comings and goings in the sport of boxing you might have missed. 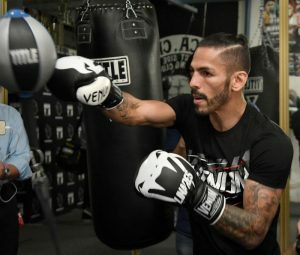 Former three-division world champion Jorge “El Niño de Oro” Linares (44-4, 27 KOs) hosted a media workout at Westside Boxing Club today ahead of his 12-round bout against Abner “Pin” Cotto (23-3, 12 KOs) in the main event of the Sept. 29 edition of Golden Boy Fight Night on Facebook Watch at Fantasy Springs Resort Casino in Indio, Calif. “Ruthless” Romero Duno (17-1, 14 KOs), who will fight in the co-main event, also attended. “I am really looking forward to fighting in Chicago,” said Briedis (24-1, 18 KOs). The Latvian hero is undoubtedly one of the favourites to take home Season II’s Ali Trophy in the 200-lb division. Tickets will be available to buy via TicketMaster.com or by calling 800-745-3000 on Monday 1 October. Fans can be alerted by email when tickets go on sale by signing up for Ticket Alerts here. Tickets, priced at $400, $250, $200 $100, $75 and $60, go on sale Wednesday, September 26 at 10:00 am ET and be available at the Marlins Park ticket office and on line at www.marlins.com/boxing. “Redemption in Miami” is promoted by New Champions Promotions in association with Marlins Park. Fight night doors will open at 6:00 pm and first bout will begin at 7:00 pm. Gamboa (28-2, 17 KOs), from Guantanamo, Cuba now living in Miami, Fla., won Gold as a Cuban in the 2004 Olympic games and is a former featherweight world champion; former super featherweight world champion; former lightweight world champion and former unified world champion. Miguel Beltran, Jr. (32-6, 21 KOs) hails from Los Mochis, Mexico, a boxing hotbed that has produced no less than five world champions. Miguel won twenty-six of his first twenty-seven fights and has fought for a world title twice. Integrated Sports Media will distribute “Redemption in Miami” in the USA on cable, satellite and digital pay-per-view via iN Demand, Vubiquity, DIRECTV and DISH; and live-streamed worldwide on the FITE.TV app and website www.fite.tv, each way for a suggested retail price of only $24.95. Groupe Yvon Michel (GYM) has reached an agreement with MG Ring Productions last Friday to hold a fight between former WBC and The Ring light heavyweight world champion Jean Pascal (33- 5-1, 20 KOs) and Canadian cruiserweight champion Gary Kopas (10-11-2, 5 KOs). The 12-round cruiserweight (200 lbs) fight will be held November 9 in Sydney, Nova Scotia, Canada. It will be a second consecutive cruiserweight fight for Pascal, the Laval, Quebec fighter, and this time he will try to get his hands on the CPBC Canadian cruiserweight belt. The Jean Pascal vs Gary Kopas fight is like a real-life remake of the original Rocky movie. In one corner there is a blue-collar road warrior, Kopas, who has fought in everybody’s hometown and not always given a fair shake, yet, he still pulled himself up to be the CPBC Canadian cruiserweight champion. Now, he’s been given the opportunity of a lifetime to fight one of Canada’s best and most notable fighters of his generation, Pascal. In the other corner is the former undisputed lineal WBC and The Ring Magazine light heavyweight champion, Pascal, who has fought some of the all-time bests. The President of MG Ring Productions, George Reynolds, and the President of Groupe Yvon Michel (GYM), Yvon Michel, negotiated for a little more than a month to come to an agreement. GYM represented Jean Pascal and his advisor, Greg Leon, for this fight. The clash, entitled “The Match of The Year”, will be featured on pay-per-view in Canada. A press conference will be held soon to reveal more details. ‘‘My last fight was a bout in my hometown (Saskatoon) against a guy from Mexico,” Kopas noted. “Besides that, I’ve been staying in the gym, learning new skills and enjoying life. When I first heard I was fighting Jean, I was shocked… happy, but shocked. Getting the opportunity to make history and show the world the best me is an insane feeling. “This is a huge fight for me. Pascal has done great things and I’m really looking forward to showing my best against a former world champion. This fight will change my life, but I want Pascal to understand that his life is going to change too, after his defeat. I hope he stands toe-to-toe with me like he did his last fight. He will not last long. “Jean Pascal is a man of challenges and when he realized the seriousness of Kopas and his organization, he decided as usual to take it,” Michel commented. In the co-Main Event, undefeated Cody “The Crippler” Crowley, who is the current CPBC International Jr. middleweight champion and current CPBC Canadian middleweight champion, will defend his titles. On the undercard, Quebecker Eric Barrak (8-4-0, 7 KOs) will fight for the North American CPBC heavyweight title, while Mario Perez (19-7-5, 11 KOs) of Toronto, will do the same for the CPBC International super featherweight (130 lbs) belt. Five championship fights will be presented on this spectacular boxing card. Others to be named. A pair of former amateur stars from Kazakhstan, Janibek Alimkhanuly and Askhat Ualikhanov, will make their Top Rank debuts in separate bouts on Friday, Sept. 28 at Oracle Arena in Oakland, Calif. Alimkhanuly will face Carlos Galvan in a super middleweight contest, while Ualikhanov will take on Angel Hernandez in a super lightweight showdown on the undercard of IBF super middleweight champion Jose Uzcátegui’s 10-round non-title bout against Ezequiel Maderna and Jerwin Ancajas’ IBF junior bantamweight title defense versus Alejandro Santiago (ESPN+, 10:30 p.m. ET). Alimkhanuly-Galvan, Ualikhanov-Hernandez, and other undercard bouts will stream live at 7:30 p.m. ET on ESPN+ — the new multi-sport, direct-to-consumer subscription streaming service from The Walt Disney Company’s Direct-to-Consumer & International segment in conjunction with ESPN. Alimkhanuly and Ualikhanov are managed by Egis Klimas, the Boxing Writers Association of America’s two-time reigning Manager of the Year. Alimkhanuly (2-0, 1 KO), a southpaw who is trained by former world champion Buddy McGirt, represented Kazakhstan at the 2016 Olympics and advanced to the quarterfinal round. He fought roughly 300 times as an amateur, winning gold medals at the 2013 AIBA World Championships and 2013 Asian Championships. He made his pro debut on Oct. 29, 2016 with a first-round TKO against Milton Nunez. Alimkhanuly last fought in September of last year with a six-round unanimous decision against Gilberto Pereira. He promises to be more active under the Top Rank banner, and if all goes well against Galvan, he will fight at least one more time in 2018. The plan is for Alimkhanuly to eventually challenge for a world title at middleweight. Ualikhanov (3-1, 2 KOs) suffered the only blemish on his record in his pro debut. He was controversially disqualified in the third round against Daniel Bastien for landing a punch on the break. In his last bout, on July 14 in Hollywood, Calif., he won a four-round unanimous decision against Darel Harris.